When painting 'conversation pieces' (relaxed portraits of family groups or gatherings of friends), artists were expected not only to show their sitters in fine clothes, but would also be obliged to include valuable possessions, indicating their wealth and social status. Tea bowls in the Far East did not have handles, and the first European imitations, made at Meissen, were without handles, too. At the turn of the 19th century 'canns' of cylindrical form with handles became a fashionable alternative to bowl-shaped cups. The pieces of tea ware available during this time were often shipped from China and Japan in mixed batches and most families did not have matching sets. They often purchased individual pieces one at a time. This was well before the large fancy European tea sets were available. European artisans started to reproducing teaware they saw from China in the early 1700s, but re-creating the delicate pieces was difficult and artisans didn't master the technique until the mid-eighteenth century. Companies such as Meissen mentioned in the quote above, started creating tea bowls and other teaware, and later produced cups with handles. An old Meissen demitasse cup from my collection, but this one has a handle! According to the book Steeped In History, Europeans required handles because they drank mostly black tea, which (as you know) is usually served at a higher temperature than green tea. The hot temperatures made it difficult to hold the delicate tea bowls. 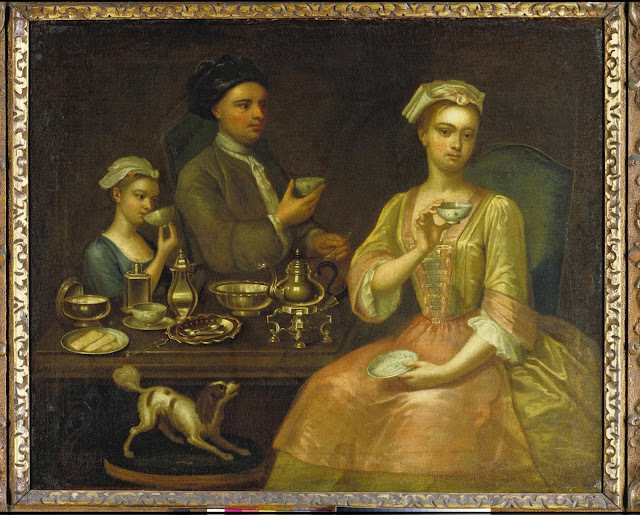 Just think about the woman in the painting above, trying to balance her hot tea bowl in her hand! The child in the photo is also holding her bowl quite precariously. When I use a gaiwan to prepare black tea such as dian hong, I do admit I have a hard time holding it because of the temperature. It makes sense handles were developed when black tea became the popular choice in England and much of Western Europe. If you have an antique European tea cup that doesn't have a handle, chances are it's quite old! Have you come across Eighteenth Century European portraits that include teaware? Or the teaware itself? If so I'd love to hear more about what you've seen! For more bits of tea history, check out my previous posts on such things as Americans sipped tea before the Brits, tea and the presidency, and tea and women's suffrage.